Collectors busting 2012 Topps Triple Threads Football will want to be on the lookout for special redemption cards. The company has added special redemptions good for one of seven different Rookie Autographed Handprint cards. Players included in the set are Andrew Luck, Robert Griffin III, Trent Rickardson, Justin Blackmon, Ryan Tannehill, Brandon Weeden and Michael Floyd. 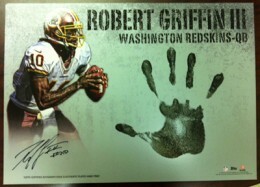 Each Rookie Autographed Handprint is over-sized with an imprint of the player's hand placed directly on the card. They are also signed on-card. Topps posted a video of the creation of the Andrew Luck card on their Facebook page. The program will continue through several other products, include 2012 Topps Valor, 2012 Topps Supreme and 2012 Topps Five Star.